Our lovely self contained unit has been designed with you in mind, fully equipped with everything you need when on holiday. Just bring your bags and move on in. A great location in a tranquil setting which is rare to find in the inner city. A large sunny section with plenty of room for the kids to run around and play. Situated next to the trout filled Utuhina Stream (and fenced for child safety) a great place to relax and unwind. The wildlife birds are always singing their tune with the cheeky Pukeko also popping by to say hello. End the day in the private geothermal mineral pool to soak away any aches and rejuvenate. Your hosts are nearby should you require assistance and are more than happy to recommend attractions to visit to make your stay enjoyable. Close to Bus stop, Dairy, Fish shop, bakery, vegetable shop, meat shop, service station, liquour wholesale, Lake Front, Hospital, Aquatic Centre, Hunting and Fishing, Mitre 10. Kuirau Park and Rotorua City. All literally within minutes drive or walk. Free WIFI and Linen included. 5 minutes to City Centre. Close to the main attractions. Nice, tidy, quiet property. Great for our family. Everything we needed. 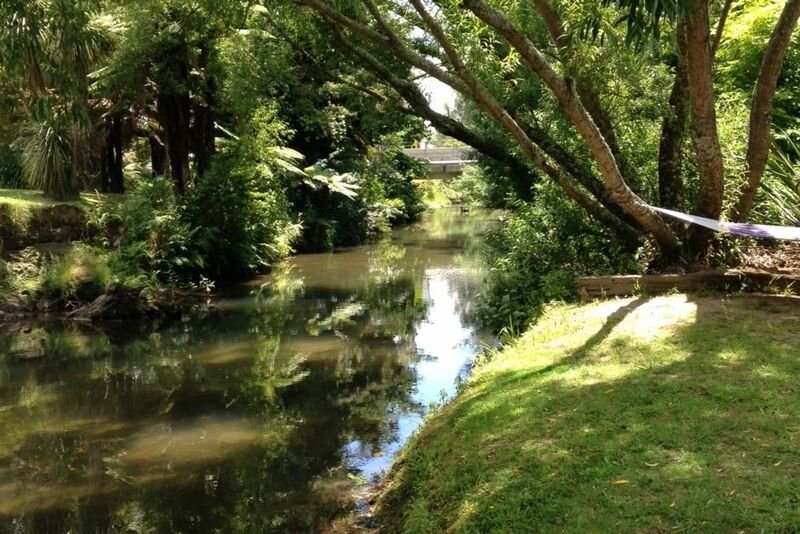 Within walking distance of town, lake front, Maori village, geothermal Kuirau Park. Very helpful and hospitable hosts. Thanks for the stay Tanya and Richard! The location was brilliant as my daughter was at a swimming comp at the Aquatic Center, it was such a peaceful lovely setting. The house was clean and tidy with everything you need, Richard arrived home as we arrived as was super friendly and helpful. The backyard swing and tramp and dolls house was a bonus for my daughter. Great hosts, lovely setting. Thanks for having us. Thank you for your stay and we are glad that it suited your requirements. Your little swimmer is a star! We were a family of four, including children aged 12 and 10. The property had everything we needed for a comfortable week away. The kids' room had two single beds and they liked playing with the doll house. The fans were much appreciated given that the weather was so hot. The back yard was huge and the kids enjoyed the trampoline, the stream, and riding their bikes around. The geothermal hot tub out the back was a bonus. The location is really good for getting around and having the free mud pool park and the Aquatic Centre a 5-7 minute walk away was a big plus for the kids. The hosts were very friendly and accommodating and we would definitely stay here again and recommend it to everyone. Thank you so much. The pleasure was all ours. You are welcome back anytime. Good location for a city venue. The property was very well equipped and was a home away from home. The property was very well equipped and was a home away from home. Our 6 year old loved the mineral bath and the trampoline. It is in a good location close to the central city.